Why Is The IMF Backing Ukraine, Despite Widespread Corruption? KIEV, Ukraine -- When the International Monetary Fund’s board convened on April 3, it found that the Ukrainian government had fulfilled only five out of fourteen structural reform conditions it had outlined. Ukrainian President Petro Poroshenko welcomes International Monetary Fund (IMF) managing director Christine Lagarde in Kiev, Ukraine, September 6, 2015. Anders Åslund writes that the IMF cannot ignore broad domestic and international opinion calling for severe measures against corruption and for social justice in Ukraine. Nevertheless, Ukraine received a $1 billion installment of its $17.5 billion financial support for the government’s reform program. Was it pure politics that Ukraine got a fourth tranche? And why did the IMF pose so many structural reform conditions when it is supposed to deal with macroeconomics? Before answering these questions, it is important to know what the IMF does, and what it does not. No international organization is faster or more effective than the IMF. It has far more funding than anybody else, and its funding has risen with the challenges. Its staff is far more qualified—and better paid—than the personnel of any other organization. It has a clear mission, and with its strict hierarchy it operates like an army. The managing director or her first deputy issues an order and an IMF mission departs within days. In desperate circumstances, it can conclude an agreement within two weeks, and two weeks later the IMF executive board can decide. The next day billions of dollars can be disbursed without the decision of any government or parliament. The IMF can operate this way because it has a limited mandate. It is supposed to support macroeconomic stability—that is, to keep countries from default and contain inflation, which usually means to demand limited budget deficits, strict monetary policies and realistic exchange rate policies. In return, the IMF can offer large and instant disbursements of credits to reinforce depleted central bank reserves. On March 11, 2015, when the IMF board adopted its current stabilization program for Ukraine of $17.5 billion over four years, it decided to issue a credit of $5 billion immediately. The money was disbursed the next day, doubling Ukraine’s tiny international currency reserves. Nobody but the IMF could have done that. If any government had tried, it would have encountered a long and tedious parliamentary process, while Ukraine would have sunk ever deeper in financial crisis. 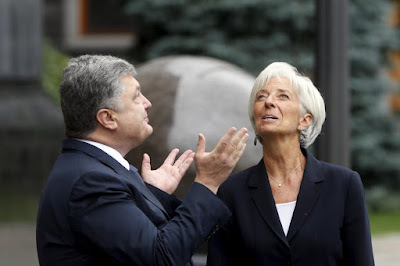 The reason the IMF disbursed the fourth tranche to Ukraine, even though the government had fulfilled fewer than half of the IMF’s structural reform conditions, is that Ukraine had fulfilled the macroeconomic conditions—primarily the budget balance, which is most important. Ukraine was supposed to have a budget deficit of no more than 3.7 percent of GDP in 2016, but it stopped at only 2.3 percent of GDP, overperforming impressively. Inflation was slightly less than required, though the foreign deficit was somewhat larger, and the exchange rate had stabilized under tough external conditions. The question of whether the IMF imposes too many structural conditions is justified. That was the main complaint about IMF programs in Indonesia and South Korea during the Asian financial crisis in 1997-98. Yet the IMF cannot ignore broad domestic and international opinion calling for severe measures against corruption and for social justice in Ukraine. The formal IMF justification is that these structural reforms are necessary to achieve macroeconomic goals. During the last period, the two most important structural conditions were that the National Bank take over the heavily undercapitalized PrivatBank, and that Ukraine implement the strict filing of asset declarations of 100,000 officials. Both were done, and the conditions that were not met were far less important. For the next tranche, Ukraine is facing no fewer than sixteen structural conditions, but the two really important ones are the parliamentary adoption of pension reform legislation by the end of April and a law on agricultural land sales by the end of May. If these two conditions are fulfilled, my guess is that the IMF will approve its fifth installment by June. But is the IMF good for Ukraine? Thanks mainly to IMF loans of $8.8 billion in the last two years, Ukraine’s international currency reserves have risen from $5 billion to $16.7 billion, which has allowed the exchange rate to stabilize and inflation to be contained, offering Ukraine real possibilities to finally start growing soundly.